One of my favorite parts of eLearning Guild events is DemoFest. During Learning Solutions last week, it provided an opportunity to look, learn, share and hear what worked, what didn’t and how a project evolves from concept to launch. 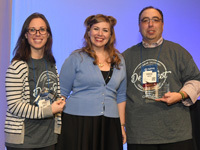 There were over 50 tables to visit, and you learn about this year’s favorites on a complimentary Best of DemoFest Webinar on Thursday, April 12 at 10:00 AM PT. We’ll be presenting our project which won an award for Best Social Collaboration Solution for Community Dashboard for C-Suite Idea Exchange. Register below to learn about the award-winning projects in several categories and get some great ideas to apply to your work!